Thinking of replacing your windows? Here are a few pointers which will help you get it right first time! This is all about making sure the salesperson understands EXACTLY what you want. Even the humble window frame may be difficult to understand completely from a salesperson’s 2D drawing. They work with these drawings every day, whereas a window isn’t a product you buy very often, and they may assume that you understand when you don’t! The worst thing is that it all seems so simple. Firstly, you need to know whether the window is drawn from the inside or the outside (many people don’t even think about this when signing off on a contract). To complicate matters further, the convention varies. In some areas or countries (typically those with a prevalence of houses), most windows are drawn viewed from the outside, whereas in other areas (where there are many multi-storey buildings), they may be shown from the inside. Having made sure that you understand which side of the window is inside your house, the next challenge it to ensure that you know where the hinges are, and hence which way the window or door opens. Sounds obvious? Not really – most salespeople will draw a diagram with a chevron representing an opening window. Some salespeople will draw the chevron pointing towards the hinge and some with it pointing away. Imagine how confusing it can be trying to compare two supposedly “identical” quotations which are drawn entirely differently! And then there’s colour. This is where it gets even more complicated. In the trade “Woodgrain on white”, often represents a window which is Woodgrain on the outside and White on the inside. But not everyone knows this, and it isn’t always the case. Again, many people (and you might be one of them!) don’t want to appear foolish by asking this “obvious” question. Couple this with the discussion of inside and outside above and the scope for error increases dramatically. Beware! Not all woodgrain colours are the same – different manufacturers have a different styles of coloured foils, even if they have the same name – so be careful when replacing a single window to make sure that the foil matches the other frames. 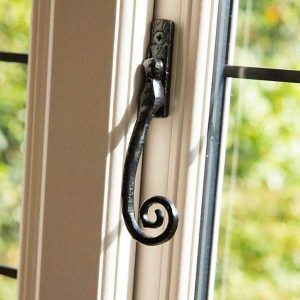 Sometimes the only way to do this is to ask for a sample of the window profile before you order – most reputable window companies will provide this if asked. This issue of foil matching becomes even more important when dealing with conservatories where the roof can often come from one manufacturer and the window frames from another. Even replacing a conservatory roof from the same manufacturer may not look right as the foils on the windows will tend to degrade over time – what would have been a perfect match 5 years ago may not be any more! Fortunately, there are some solutions to all of this. Many salespeople nowadays use 3D software to display their windows or conservatory. This allows the customer to see a 3D representation of their order before they commit to it. Not only that, some software allows the customer to walk “through” or “past” their proposed improvement.